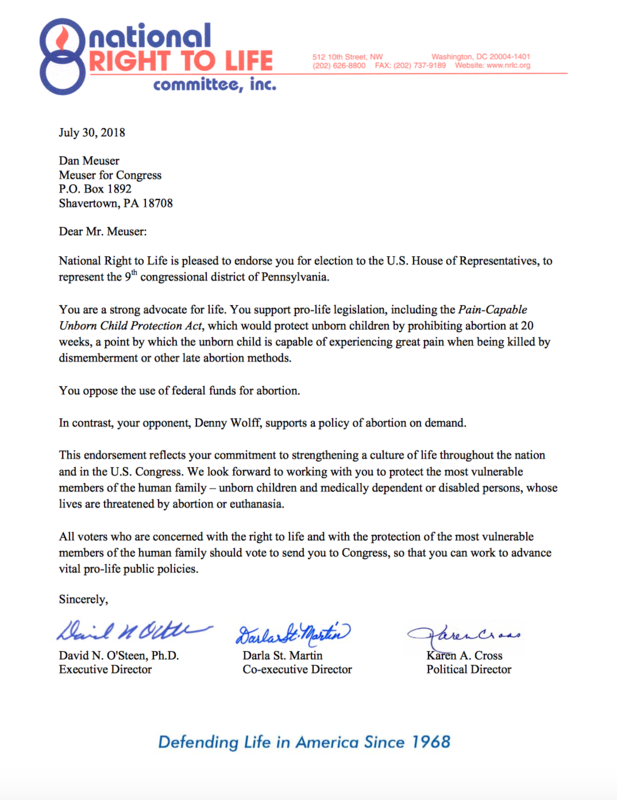 POTTSVILLE –Meuser for Congress is pleased to announce that Dan Meuser has been endorsed by the National Right to Life Committee. In their endorsement, the committee praised Meuser for being a strong advocate for life and supporting pro-life legislation, including his support of the Unborn Child Protection Act, which would protect children by prohibiting abortion at twenty weeks. The committee commended Meuser for his commitment to protecting the most vulnerable. “The important issues of the Right to Life community are and will be part of our agenda,” said Meuser. To read the full endorsement from the National Right to Life Committee, CLICK HERE.